Bathrooms are one of the most un-attended places in the house since it is a necessity and not a place of admiration. We mostly use our bathrooms to the extent of toilet and showering, rush in and rush out to get ready in the bedroom, that you love. But guess what, you can even make your bathrooms look luxurious and getting ready would just be plain fun. If your bathroom is a dull white since the longest time, or bright pink or even an electric blue which would have felt fun at the time but now is just boring. Change it. Change of color completely alters the entire aura of the room. If you are planning a decent change to the area, you can go with off whites, pearly whites and by wooden accessories, enhance it. 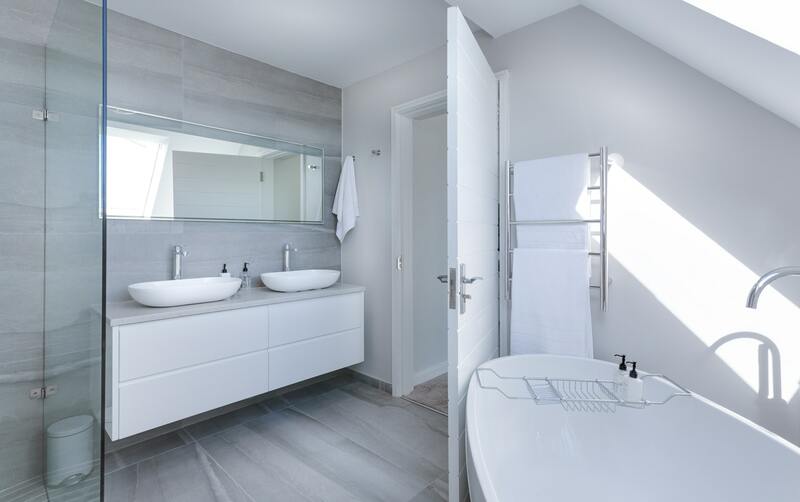 If you have a tiny bathroom you can still alter it with effective changes to make it look more appealing. Add a wooden panel wall behind the toilet or beside the bathing tub. Decorate it with white shelves and place pots of succulent and ta-da! Complete a new look. Every bathroom has a mirror, small or large but the old plain ones just don’t do it anymore. Define the mirror by putting a nice tainted frame or an antique Victorian sort to make it have bright, decent boundaries. You can even have multiple mirrors placed in sequence to add an interesting touch. Attach a small extendable mirror along the larger one and get that winged eye-liner right for once! Old and rusted sanitary ware always puts the entire mood off. Replace the old ones with new designs or the traditional decent ones to brighten up the room and immediately give it a new, fresh look. Change the vanity, if you may, with the one having cabins and slightly tall feet, preferably brown. That gives a unique homeliness to your bathroom along with storage space to keep ugly cleaning utensils hidden. If you have a plain wall, consider yourself lucky. Insert wooden slabs in different patterns to make room for storage and add texture to the bathroom. Try wooden tainted ones for plain white walls and white wooden ones for other colors. Roll up your towels and place them on top or decorate with adorable succulents. Attack hooks underneath for hanging your clothes. Design and functionality brought together. Add color and texture by placing different accessories. Put a tiny plant pot here and there, add scented candles, hang up frames on empty walls, cane baskets add the ‘C’ in Classic. You can even replace your old lights with new decent looking ones, according to the aura of the room. There are a million ways to make your bathroom look luxurious, all it needs is your little attention and you may actually end up like getting ready early in the morning.